And the next Arcade Mode interior.... is the Inn! Or the tavern! Whatever you wish to call it. True, it does not have beds, but who's to say there isn't a hidden door somewhere that leads upstairs? 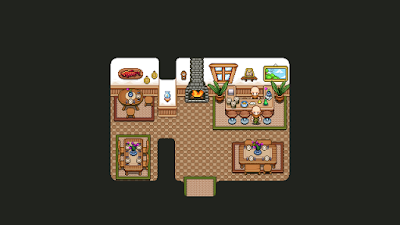 In either case, this is sort of an upgraded version of the old Tavern in Arcadia. Doesn't look exactly the same, but I went for the same sort of feel and the overall layout. When everything is implemented this place will probably have more visitors than it currently does, more inhabitants looking to hand out quests! Next up we continue the Arcadia rework, today starring the the farm interior! 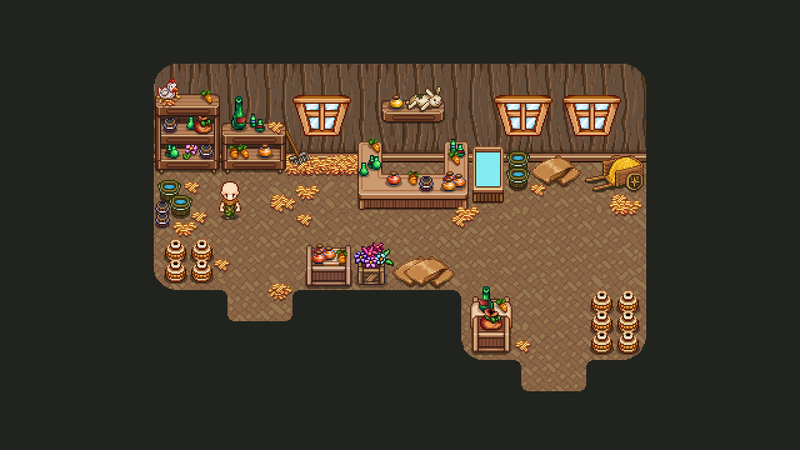 This place will have the same look and feel as the farm in Evergrind West, only with updated graphics and more stuff. We're actually considering replacing the old farm interior in Story Mode with this one, but we haven't fully decided yet. On one hand it looks a lot better graphics wise, on the other it's kind of nice to have the unlock in Arcadia be a bit more special. On the third hand (...let's not get into anatomy...) many players will probably never play Arcade Mode or get to the point where they unlock the Farm, so it means a lot of people won't get to see the better version, while most people likely will visit the farm in Story Mode at some point. This place was actually quite a bit of a struggle! I'm working on my rendering technique for those pesky wall textures, trying to fins a nice balance between too plain and too much detail/colors. The main part of this room is the bell, which will allow you to change the time of day, and the window which indicates what time of day it is. The window will be animated by Fred at some point, where the image will turn from night to day. 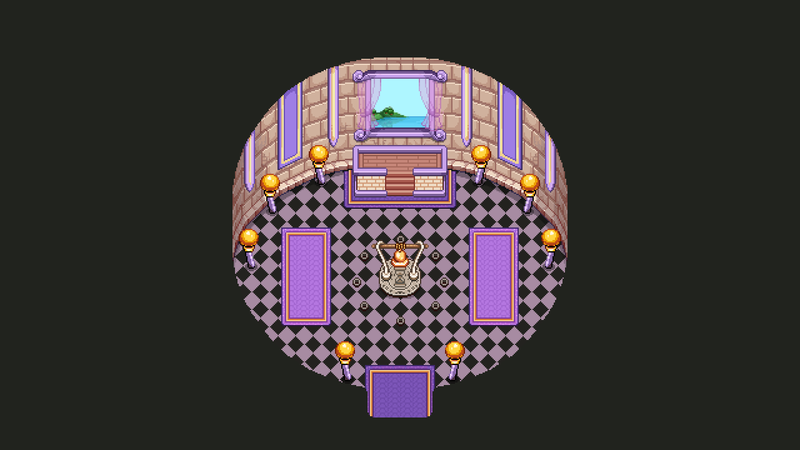 At that point the background might look completely different depending on what's easier to animate for him, but for now I just put a piece of the Arcadia background there instead of keeping it empty. One thing we didn't mention in last weeks posts are what will happen to your old potions. We aren't so cruel as to simply remove or disable the pots you've bought so far - instead they will turn into pet food (which, honestly, is probably what most of you have used them for so far). 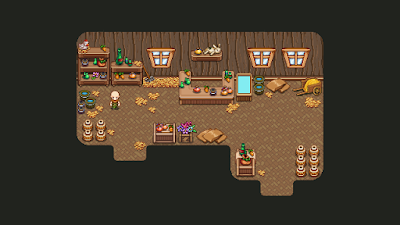 As such, we'll be adding a new shop to the game: Oak's Pet supplies, found at the farm in Evergrind West! At Oak's Pet Supplies you'll be able to buy dishes to feed your pet(s) with, each one boosting a different stat. At first, we weren't sure whether we wanted to keep these foods simple, calling them simple things (such as HP Food, Crit Food, etc) and having a very basic appearance (basic pet food cans in different colors and with different icons depending on what stat they boost). However, after some discussion we thought it'd be more fun to use 'real' dishes, with fancier names. Sure, it does not make as much sense that Oak is selling outright food at his farm, but we'll make that work later on. Maybe that's why nobody is buying things at Belmont's café? Oak is serving better stuff for cheaper! It's food for pets but who cares so long as it's tasty, right..? Light Ceasar Salad - Nothing like a light salad to keep you up on our feet! This dish is replacing the old speed potions, and boost speed when fed to your pet. Hearty Stew - A thick and warming stew to boost your health! Feed it to your pet and you'll get a nice HP increase. Spicy Prawn Soup - A hot soup that will help you land those crits after you feed it to your pet. Grilled Rib Eye Steak - A grilled beef to keep your damage high. Replaces the old damage pots. Sweet Sundae - Finally, a sweet dessert for your EP needs. Feed your pet this yummy dish and it will be sure to help you keep that EP up and running. And the title of the shop page! 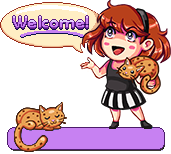 We decided to go for Pet Supplies rather than Pet food since we want to keep our options open: maybe Oak will end up selling other things as well! Such as new taming items.... We'll see! And so, the potion patch is up! This patch includes the complete potion rework, a ton of new pots, a rework of Remedi and his first quest plus a brand new quest involving Remedi and his nephew (which will be available if you've finished his first quest and have started your journey in Mount Bloom). As always, especially with new systems, we're eager to hear your input on these changes to the potion system. There are a bunch of potions to test, and we're interested to hear how you feel about the effects: are they powerful enough compared to the recharge time? Is it satisfying to recharge potions in battle? Are you more inclined to use potions now, or did you prefer the old system? A lot of you have waited a long time for some kind of healing spell or health pot, and health potions are now available!! So let us know how you feel about that as well. The full patch notes are available here, so be sure to check them out if you're interested in the specifics! And do let us know how you feel about this new system (and the new quests), either on our forums or here in a comment. We look forward to hearing all of your feedback! Like me and Teddy, Fred too has been busy doing potion stuff this week! I also made small versions of each of the icons, to serve as buff icons / timers for the potions that work over time (and whatever else we might need them for)! Now, what in the world is this?! A portrait of a cave troll? What is it doing here? What part will it have in our story? For now, all I'll say is that it's related to the potion quests, and will appear in the next patch! 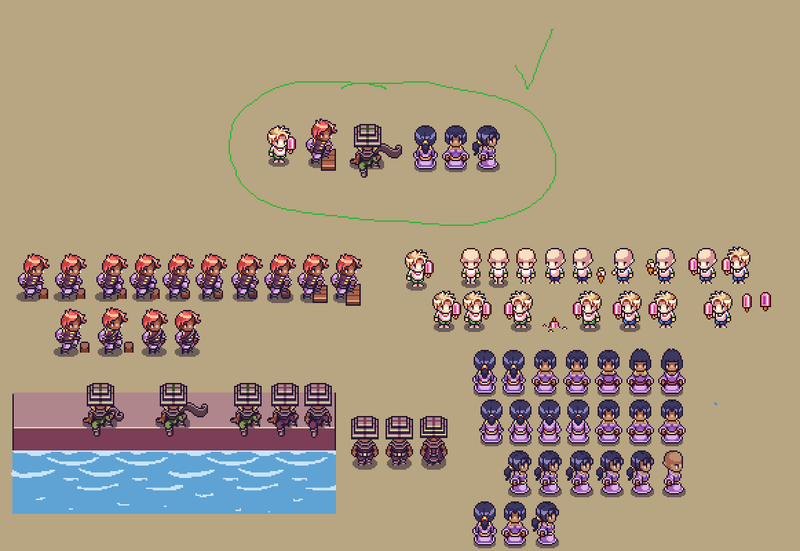 So as we're drawing ever closer to finishing up the whole potion business, it's time to pump out a bunch of new portraits to fit in with Remedi's new questline which will grant you the empty bottles you need to use this new mechanic! So one of these days we had a really long discussion about how to get the new potion bottles (specifically bottle number three), which resulted in us doing an overhaul of Remedi the Alchemist's character and planned questline. A perhaps little known fact about Remedi is that he is in fact a rather old man trapped in the body of a youth after an accident in the lab. He mentions this briefly if you talk to him when he's not involved in a quest, but it hasn't been very clear this far. In order to amplify this, we've decided that he should start off as an old man, and be transformed into his young version when he has the Pumpkin Woods quest for you. ... and so on! At this point we wanted to quest to be quite straight forward, so finally we settled for the last one in that list: battling some special, elite shroomies as well as getting a bunch of other drops from the mountain. 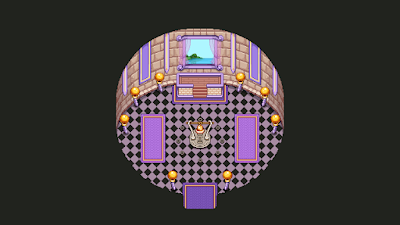 We also discussed when exactly you'd be able to get the quest, and while we said from the beginning that it would be available after Temple of Seasons, we decided to have it activate once you've started Lurifix quest inside Mount Bloom instead. The reason for this is so that people who haven't been in Mount Bloom yet will be able to pass through the area without any special elites appearing in their first playthrough, possibly confusing the quest mobs for regular mobs!